"Drysdale's book is by far the most comprehensive - everyone in the office has a copy...now including me. It holds just about everything you need to know about fire science." After 25 years as a bestseller, Dougal Drysdale's classic introduction has been brought up-to-date and expanded to incorporate the latest research and experimental data. 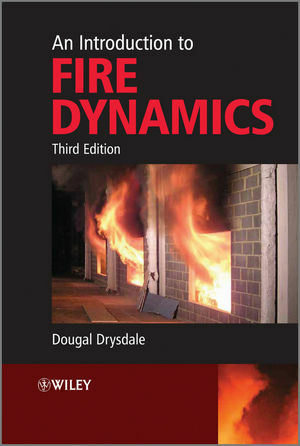 Essential reading for all involved in the field from undergraduate and postgraduate students to practising fire safety engineers and fire prevention officers, An Introduction to Fire Dynamics is unique in that it addresses the fundamentals of fire science and fire dynamics, thus providing the scientific background necessary for the development of fire safety engineering as a professional discipline. Will appeal to all those working in fire safety engineering and related disciplines. Professor Dougal Drysdale recently retired from the University of Edinburgh, where he maintains the position of Emeritus Professor of Fire Safety Engineering. He is a past president of the International Association for Fire Safety Science. His research interests include spontaneous combustion, fire dynamics and behaviour, and fire investigation. After 21 years as a bestseller, Dougal Drysdale’s classic introduction has been brought up-to-date with the latest data and research in a third edition. Features numerical problems with answers illustrating the quantitative applications of the concepts presented. Includes quantitative experimental data regarding material properties. Successfully course-tested at Massachusetts' Worcester Polytechnic Institute and the University of Edinburgh, and widely adopted throughout the world. Of relevance to those working in building design, fire physics and chemistry.